It’s that time again! 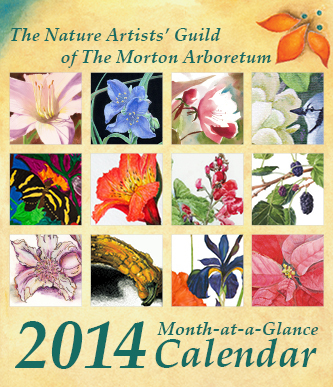 The Nature Artists’ Guild will once again be publishing a desktop calendar featuring members’ artwork. Proceeds from sales of the calendars, which will be available at the Holiday Exhibition, help support the activities of the Guild. This is a great opportunity to show off your work (and can make your holiday shopping easier!). You can see the 2014 calendar here. Guidelines will be e-mailed to members in the next week or so – Please review them before submitting your work. The deadline for submissions is September 12, 2014. If, after reading the guidelines, you have questions about how to prepare and/or submit your work, please contact Mary Ingels (members can find her contact info in the Yearbook). If you click on “Search by Category” and then “Artists’ Calendar” in the right column of this blog, you’ll be able to view some examples of previous calendars. You’ll see that Mary has done a fantastic job with all types of artwork formats, so you may find that your art would be suitable after all! It appears that the selected pieces are single objects, centered, with background surrounding them. My art is in a more natural setting, so I won’t submit again since it is not suitable.